>For the second year, Marquis Stoudamire is working with a group that presents free movies in Portland’s parks. 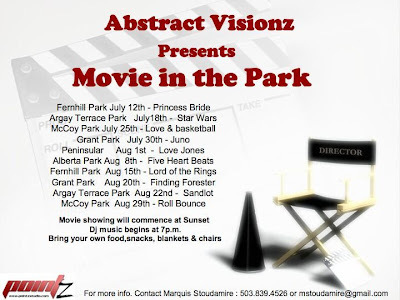 On August 1st Abstract Visionz will present the movie Love Jones in Peninsula Park. The full schedule of movies is below. This entry was posted in Events and tagged Abstract Visions, Marquis Stoudamire, Parks, Peninsula Park by Noah Brimhall. Bookmark the permalink.